Thanks for the question, Samantha. Here are a few thoughts on the subject. Stallions with a very high drive to bite are a challenge with no easy answer. If they are corrected early on during all human interactions it can be slightly easier but the ones that choose to be mouthy, choose that as an expression of their desires. I have had amazing stallions that were very well behaved, decent stallions that were behaved most of the time and stallions that were always pushing the boundaries. When I trained for the public I dealt with all of them but as my business grew and my knowledge grew I started making different choices. In college (I went to an equine college) the vet had a saying, “A good stallion makes a great gelding”. He was noting that there was an improvement in some way when gelded. What does the industry value? In the reining industry, the stallions must be both athletic and highly trainable. Reining horses are required to reach a higher level of training than say a racehorse. Because of this, the horses are being bred to be both athletic and trainable. 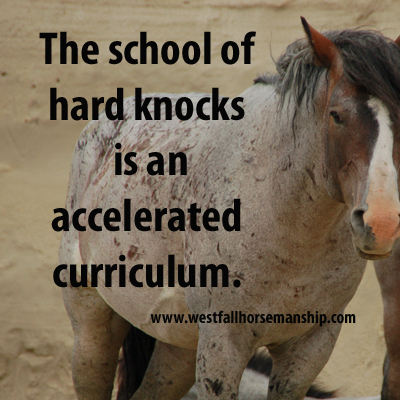 There are more and more stallions in the reining industry that are very trainable and easy to be around because of this. In other industries, the performance outweighs the level of ‘trainability’. This isn’t to say that a racehorse isn’t trainable but it does acknowledge that the ability to race fast is more highly prized. What is the goal with this stallion? Mustang stallion displays his battle scars…scars he thought were worth fighting for. To Geld or not to Geld. What is the long term plan for this horse? This is a conversation worth having with the owner. As a trainer, you don’t have the full say of what happens with the horse but you do have control of which horses you decide to train. You must decide what level of correction you are willing to use…but remember that the stallion might ‘ask’ for more. Think about the fights that stallions have with each other in the wild. Some will really turn up the pressure. In my world, my answer would be to geld him. I know this because when Newt was just turning two he started getting mouthy. He had always played with other horses using his mouth but he started doing it more and more to people. The distraction in his mind that was driving this behavior would have also caused distractions in other areas of training. I gelded him. I chose it early because I didn’t want his hormones to create other bad habits and I knew the distraction level was going to change the training and require me to be harder on him. Gelding him took away the desire to bite and made his life around humans and other horses easier. There are other industries that may overlook the behavior for other qualities but I’m only going to speak from what I have seen. Twenty plus years later I agree even more with the wise old vet from my college years. A good stallion makes a GREAT gelding. Thank you for the answer. After another good talk with the owner and discussing your answer she finally decided to geld him!!! So for the horse this is the best outcome and I’m really happy that she made this decision. However, I still wonder what is the best way to correct a horse that bites? Would you make him move his feet, or keep him out of your space and for how long? I tried all this with the stallion for months. It got a little bit better with the biting, but not much. I know he is not the best example for this, but he is not the only horse who bites. How would you correct this behavior to prevent the cycle of correcting-biting-correcting-biting ?